A chullarh of creamy spicy and sweet masala chai. Chullarh is a single-use cup and when the tea is finished, one simply throws the cup on to the ground which breaks into pieces and disintegrates – return to mother earth, as they say. My 11 day, 2,486 km tour of India and Nepal with my family and a 30-odd Singaporean Buddhists covered all the 4 major sites (birth, enlightenment, first sermon and death of Lord Buddha) along with several minor sites organised by the Singapore Buddhist Fellowship. While this trip was meant to be of a spiritual nature and a chance for me to spend time with my family, the tea lover in me couldn’t help but look out for signs of India’s tea culture. They weren’t difficult to spot! By the side of the River Hooghly I had my first encounter with masala chai. Trying hard to conceal my excitement (this is a Buddhist pilgrimage trip after all! ), I saw a “chai wallah” (“tea person”) street hawker selling masala tea using the most rudimentary of equipment: a small oil drum serving as a stove-stand housing a kerosene stove, a few very well-used, tea-stained pots and metallic jugs, a plastic sieve, and rows and rows of tiny clay cups known as “chullarhs” . 11 day and 2,486 km tour of India and Nepal with the Singapore Buddhist Fellowship. The “chullarh”, I think, is a testament to the ingenuity of people in India. It is a small, hand-made clay cup not more than 30-40ml in capacity. The cup is fragile as it is not fired at high heat or glazed. It is single use only and when one’s tea is finished, one simply throws the cup on to the ground or (at more urban locations) into a carton box. The cups break into pieces and simply disintegrate – return to mother earth, as they say. All very ecological and green. But being the pristine Singaporean that I am, I did wonder about the hygiene of my cup, not so much because it was unsterilized but because there might be natural toxins or residues in the clay given that it wasn’t fired at high temperature. I have bought a number of these chullarhs back with me and they will be on display at this Sunday’s tea open house. I have one on which you can still see the actual thumbprint of the maker – which makes me wonder about the man or woman or child who made the cup. Should I or should I not drink this chullarh of masala chai? Yes, of course I will! 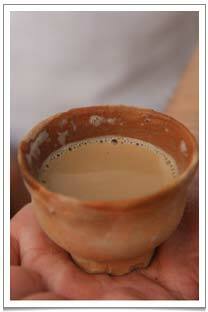 Each chullarh of delicious masala chai costs around 3 – 5 rupees (£1 = 70 rupees). Yes, no more than 7 British pence! My brother and the local tour guide, Mithilesh Kumar Singh (affectionately known as MK), promptly bought us all cups of the masala chai. My excitement quickly turned into a dilemma. I had been told not to risk the rest of the trip by drinking or eating outside the “safe” confines of the hotels. So should I or should I not? I chickened out a bit and took the tiniest of sips, barely enough to get a hint of the creaminess, intense sweetness and dark spicy tea flavours. But I fell in love with masala chai. 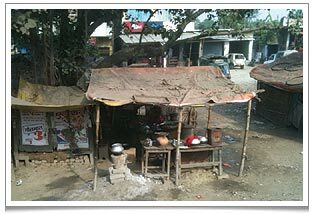 A makeshift roadside ‘chai wallah’ tea-stall which caught my eye as we drove through India and Nepal. Masala chai, I was told, is an ancient Ayurvedic concoction for cleansing the body and is drunk as a remedy for minor ailments. It is thought to have originated in the royal courts either of India or of Thailand, but the concept of boiling tea leaves with spices could have come from China during the boiled tea era. There is no masala ‘recipe’ as such. Much like the garam masala that we know, it is a completely flexible concoction and each family or individual has their own favourite version. But talking to a few waiters at various restaurants revealed a whole range of spices that can serve as ingredients for masala chai, from the usual suspects like cardamom, ginger, cloves, cinnamon, nutmeg and mace, to the more unusual ones like allspice, black, red or green peppercorns, bayleaves, cumin, fennel, star anise, ajwain (smells like thyme), liquorice roots, saffron, white poppy seeds and lemongrass. Cocoa powder and vanilla seeds may also be included, which I suspect could be a modern Western influence. All these spices and flavourings are warming in nature. MK told us he likes the simplest form of masala chai most of the time, which involves only water, milk, tea powder, sugar and green cardamom. However, when he’s so inclined, his version of masala chai could potentially have up to 8 different types of spice (hence I called it India’s Eight Treasures Tea). In various hotels in India and Nepal, I enjoyed masala chai with all sorts of different amounts and combinations of spices. Some had a warming, delicious hint of ginger while others were concoctions with nuances of nutmeg, cloves, fennel and the ubiquitous cinnamon. 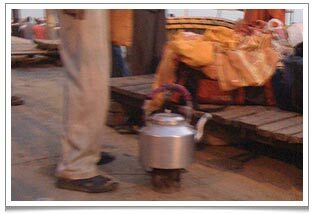 The Ganges lemon tea seller’s ingenious portable kettle with stove attached. The best tasting one for me is from the Hindustan International Hotel near the River Ganges in Varanasi, a thick and creamy tea with a hint of ginger, cardamom and cloves. The fact that I was picked “at random” by the staff of the hotel and given a very nicely decorated dish of sugar-coated fennel seeds as a mouth refreshener – no doubt hoping I would give them a positive report on their service – really has nothing to do with my choice, but was a pleasant addition! The base tea in masala chai is typically the more astringent Assam CTC or the full-bodied Ceylon Black. The astringency and strength of these black teas are needed in order to stand up to the spices in both the tea and the accompanying food. 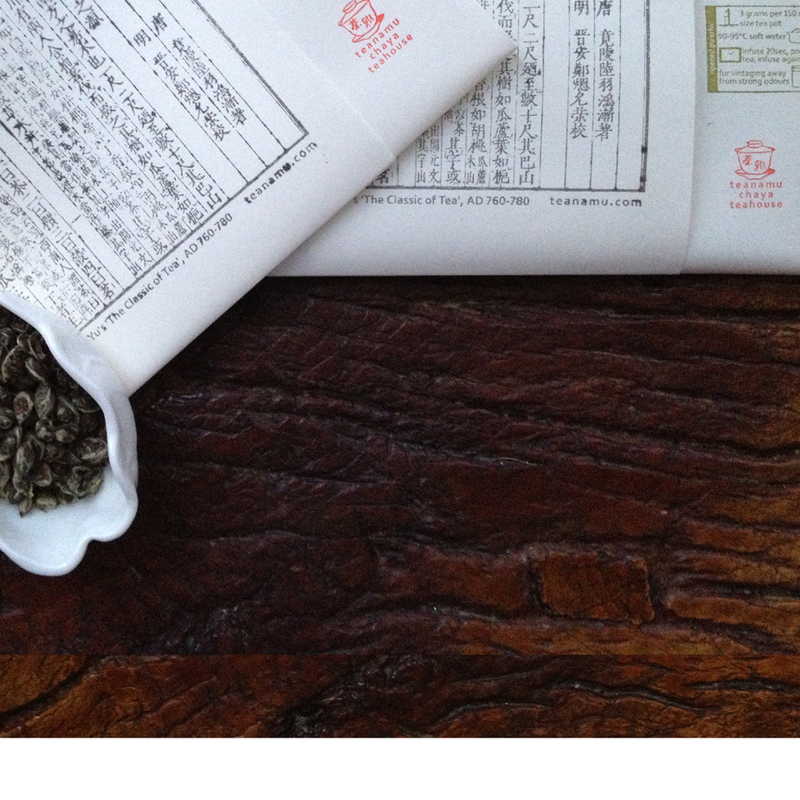 I later learned that the more malty and chocolately China’s Keemum black (aka Qimen Hongcha 祁门红茶) is also used. So is Darjeeling tea but in my opinion its light floral perfume qualities are best left to be appreciated unsullied by spices. 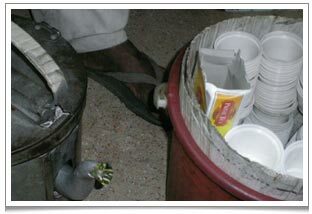 The chai wallah’s hot kettle of sweetened milky water and his pail of cups, tea bags. The quickest way I know to make delicious creamy masala chai. 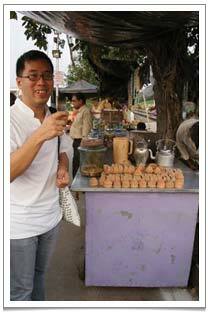 For many of my travel companions, masala chai was way too sweet. The large amount of sugar acts as a backdrop for the spices and the fresh milky creaminess helps to calm down the spices. The sweet creaminess of the tea is very similar in taste to the teh tarik (‘pulled tea’) I grew up with in Singapore; teh tarik uses sweet evaporated milk. I wasn’t as prepared for the poverty in India as I thought I would be. In many towns and villages there are no street lights and sanitation is not to be found. Most if not all of us on this trip had to use “toilets” in the bushes. But with the urge to survive, human ingenuity prevails. I have seen street hawkers using oil drums as a fire stove and simple flattened piece of metal as a frying pan or a piece of dome-shaped granite for baking chapatti breads. I was particularly impressed by the chai wallahs selling lemon tea along the River Ganges and masala tea and coffee on the overnight sleeper trains. They walk up and down, in one hand a hot kettle of sweetened milky water heated by an attached stove, in the other hand a pail containing disposable cups, tea bags, coffee powder etc. To serve a customer, the chai wallah takes a cup and put either a tea bag or instant coffee powder in it, then promptly pours hot milky water to the cup and a milk chai tea or coffee is produced with minimal hassle. India is a very dramatic country: the heat, the spices, the intensity, the ingenuity of the people have created a culture that is truly unique and beautiful. I see all of that embodied in a humble chullarh containing the wonderfully comforting and flavourful liquor that is masala chai. – Bring the water to a boil. Add milk and bring it to a boil again. – Add the spices and tea. Bring to a quick boil and infuse for 1 minute. – Strain the tea into a container and then pour it at a height to another container to cool the tea a little and to froth it a little. I can’t wait to read more about your trip, Pei and when we get together for dim sum, I want to hear all about it! Yes! Can’t wait to meet you and eat dim sum!